Buckle up , because this bud has got some kick. Sabotage OG is a cross of Gorilla Glue & White Slipper. Two very strong Indica strains. 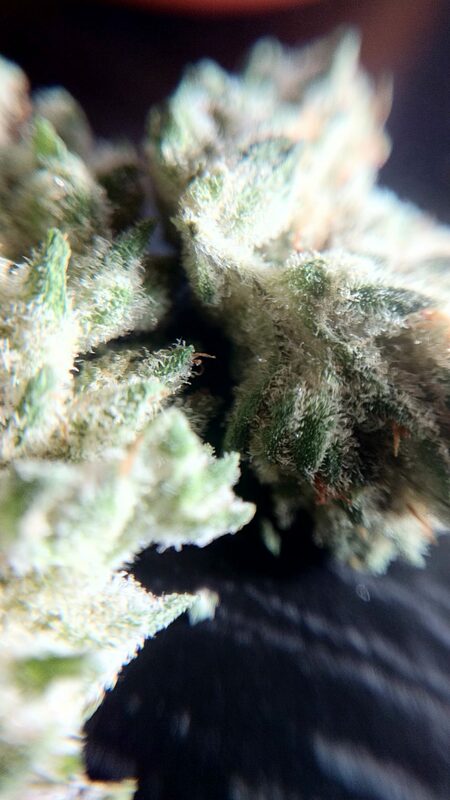 As you can see from the close ups, this bud gets absolutely engorged with crystals and it will leave you feeling like you just finished Thanksgiving dinner, ready to hit the couch. I absolutely would not recommend this strain as a wake and baker, that is, unless you have a propensity to get energised from strong indica strains (which does happen). I can imagine it would work well as a muscle relaxer, and an end of the day wine sipper. I would pair this bud with some ASMR videos and a comfy couch with one of the mattress toppers on it. You’re basically going to feel like you’re connected to the couch. With a whopping 26% THC you can be rest assured that if you smoke this weed, you’re gonna feel it. I actually mixed a bit of this with the high CBD strain “The Queen” and the results were quite nice, albeit a bit groggy and slow. The taste isn’t anything to write home about, it’s got some hints of polyeurethane mixed with dead rat. Not exactly something that will have you licking your lips, however if you need something to really knock you out, and help your muscles relax, then Sabotage OG certainly did that for me.